FAIRFIELD, CT - Sacred Heart University’s College of Health Professions has established a new undergraduate major program in communication disorders, opening in fall of 2019. It will prepare students for graduate work in the fields of speech-language pathology (SLP) or audiology. The degree can be pursued as either a traditional 4-year or an accelerated 3+2 program. The 3+2 option includes three years of undergraduate work before entering the two year master’s degree program. The undergraduate curriculum consists of courses in preparation for graduate work, including anatomy, physiology, and neurology of speech, language, hearing and swallowing; as well as courses on the typical development of speech, language, and hearing; the nature of sound, and the structure of language. The program also requires courses in science, math and psychology. 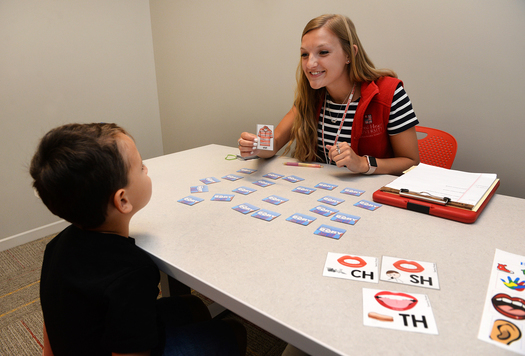 “This new program prepares students for jobs in speech-language pathology upon completion of a two-year master’s degree, following their undergraduate program,” said Rhea Paul, chair of the SLP program. Students wishing to become audiologists will pursue a three-year professional doctorate in their field. Speech-language pathologists and audiologists are in high demand, Paul said. These professionals also work with children, and there is especially strong demand for speech-language pathologists to work in schools to help young people succeed in the classroom, according to Paul. For more information on the communication disorders program, including course work, visit https://www.sacredheart.edu/academics/collegeofhealthprofessions/academicprograms/communicationdisorders/undergraduatemajor/.